The gloss was taken off yesterday’s excellent victory for me by the decision of one/some of our away supporters to hold up a banner at the end of the game which called for Arsene Wenger to resign. No one is going to complain about a banner that is positive in its message, but do we have a right to display negativity in such a public way? Of course freedom of speech says we do, so let’s qualify the question a bit in this poll. You can tick multiple answers if you choose. Wembley! Wembley! We’re the famous Arsenal and we’re going to WEMBLEY!!! Arsenal’s romance with the FA Cup continued last night after an epic quarter final win at Old Trafford to finally put an end to the hoodoo at the stadium which has cursed them in recent times. A journey with three friends and my nephew was very fun indeed and we were all in good spirits despite our concerns about our record at Old Trafford. I was also buoyed by Bangladesh’s win in the cricket World Cup! But football was the focal point now. Little did I know at this point I would witness one of the best games and atmospheres (only the Arsenal end) I have attended. A quick mix grill and off we were to the “Theatre of back passes” a term used to malign the Manchester teams style of play this season. The game started with Arsenal giving away cheap possession and Fellaini putting his weight about much to the annoyance of the Arsenal supporters. In the East Stand where the Arsenal supporters were placed, there was a feeling of injustice when Hector Bellerin was booked for a foul on Ashley Young who seems to have been taking more diving lessons from British swimmer Tom Daley. This infuriated supporters with almost every Arsenal fan pondering why referee Michael Oliver booked the young Spaniard so early in the game for his first tackle. The fans though rallied behind the team and there was a feeling of togetherness between the travelling faithful constantly singing in tune. Then the other Spanish full back, Nacho Monreal, who has become an unsung hero, was played in by Alex Chamberlain after a fantastic run, and there was Nacho to finish emphatically beating De Gea at his near post. The joy amongst the Arsenal fans was short lived. Only moments later Di Maria found Shrek with a cross whose header found the back of the net. The Arsenal fans were seething and the inquest began between supporters about why Shrek was left with so much room and venting their frustration at Koscielney and Mertesacker. Chesney then kept out Di Maria’s effort saving with his legs and then half time came and Arsenal were able to re-group. 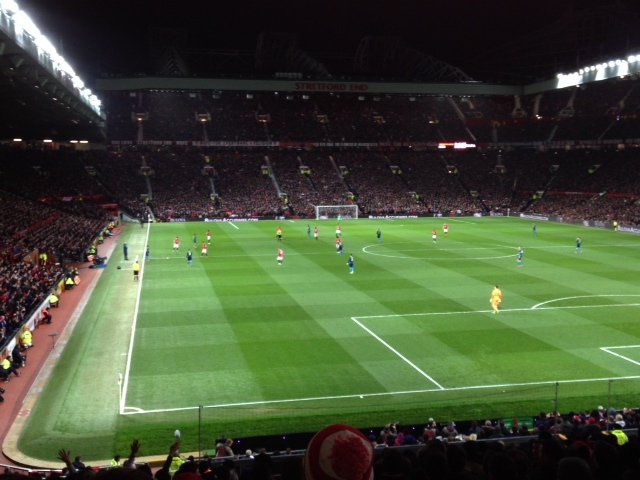 The Arsenal fans were in fantastic voice mocking the hosts and hurling constant abuse at Manchester United supporters. This stemmed from the rivalry between the clubs and supporters even took a trip down memory lane in the stands by talking about past encounters where Arsenal got stuck into the dirty Mancs, notably the infamous brawl in 1990 and Keown’s swipe at the cheating Ruud Van Nistelrooy in 2003. Arsenal came out in the second half and stood firm and then in the 61st minute a moment which stunned the Manchester United supporters. A back pass by Valencia was seized upon by the tireless Danny Welbeck. The forward rounded the hapless De Gea and slotted home to send 9,000 Arsenal supporters into absolute raptures. Security officers and stewards were called into Block E233 by this point as a section of Arsenal fans were standing on seats and on top of walls, causing havoc, such was their delight. The stewards had a difficult job to contain them during this jamboree but who could blame them? The Arsenal fans were really now enjoying themselves and constantly taunting the Manchester United supporters which would last until the final whistle and outside the ground. There was still over 30 mins left and Arsenal weathered the storm. Di Maria was then sent off after putting his hands on the referee and then Arsenal absorbed many attacks, mainly long balls. Fellaini was up to his usual tricks of using hands and elbows and was finally booked, cue the sarcastic applause for Michael Oliver who finally brandished a yellow card to him. Arsenal then hit United on the break with Santi Cazorla drawing a fantastic save from compatriot De Gea, who then denied Alexis. After 5 long minutes of injury time the final whistle came and the night belonged to the North Londoners. Arsenal booked another trip to Wembley but it was not over there.. This was one of the best results in recent years and despite there being a split fan base over the season there were no signs of it on this night. The Arsenal fans went mental, singing, mocking Manchester United fans, dancing in the stands and then outside the ground much to the anger of the police who could not usher the Arsenal fans away. 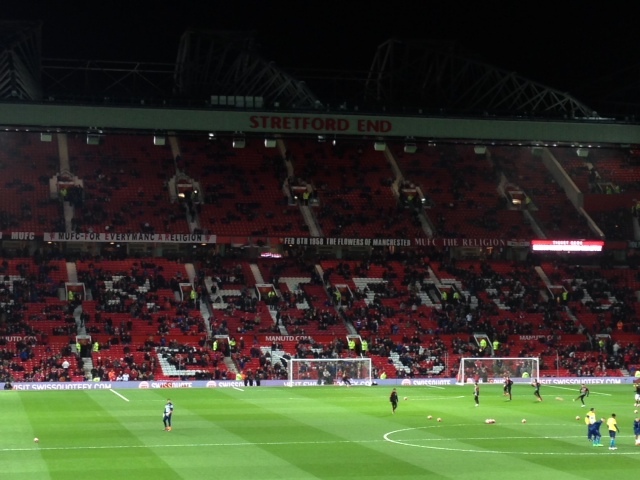 Nine thousand fans who made a long trip despite the fixture being on a Monday night causing chaos for people who had work, school and other commitments. Miserable Manchester United fans walked past the dancing Arsenal fans singing “WEMBLEY” and the look on their face was priceless, knowing that Arsenal ended their season. 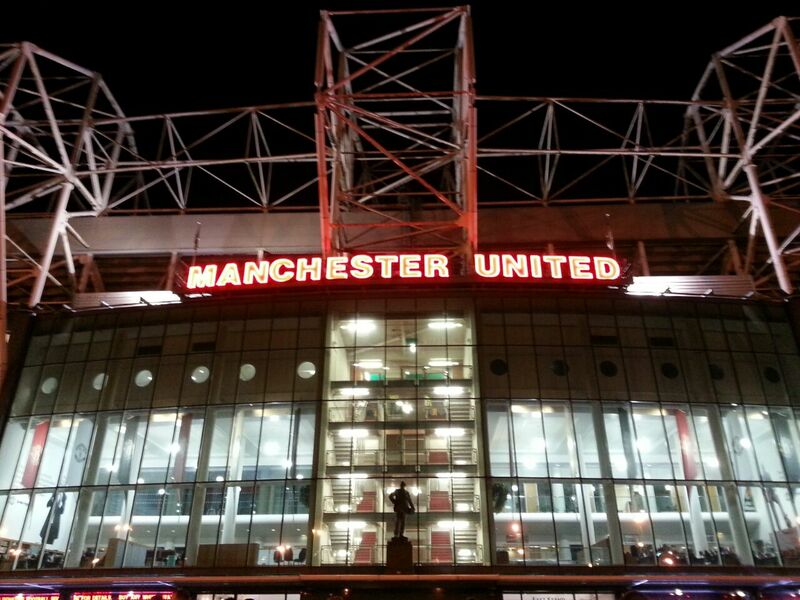 Maybe now these United fans were off to the supermarket to get those sour grapes before going home. 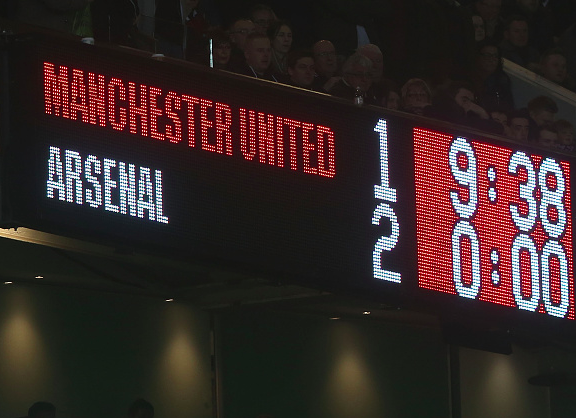 Arsenal players, Manager and fans can be very proud after their performances on this night. Everyone associated with the club played their part. Here are a few AAers’ comments after the game …………………. I think I would describe that as the perfectly executed plan. Who would have thought that Wenger would have started with a 4.2.4 line up? The idea was clearly to go at them, all guns blazing, get ahead and by doing so would force them onto us, before bringing Walcott on in the latter stages to run riot with his pace. And that is exactly what happened. If Boro were hoping for a lift from Wenger opting to field a weaker team they were disappointed. Welbeck, Giroud, Ozil and Sanchez up front, wow that is some front line. Gabriel didn’t have that much to do but there were some very encouraging signs. His professional foul was a South American master class. I felt we gave a good account of ourselves, pretty on the eye, plenty of possession with some nice quick passing. I would like to see us making challenges earlier on forward running attackers as i feel we open up and give them chances but apart from that not bad at all. My MOTM would have been Gibbs the lad ran up and down all game and made his self a nuisance but also did his defensive work well. Very happy with that effort but have to say expected more goals but 2 goals is still blinding. Don’t want to leave Chambers out another fine days work son. Gibbs had a very positive game obviously showing he wants his shirt back. But I think I loved watching the front three of Ozil, Santi and Alexis, they were walking into little spaces and making gorgeous passing. Past their way out of the press with ease. Also has anyone noticed the skill Welly uses quite a lot, where he kind of allows the player to commit a sliding tackle before he touches the ball and he kind of picks it up with his trailing leg, it’s very effective and useful because he seems to break away more often than not using it. Let’s not forget this was Boro and we are going to face better less gappy buses than this in the remainder of the league campaign. Szczesny 8 – Not much to do – Great having him as second choice keeper! We set off from Nottingham at 8am to make sure we’d get down to Brighton for midday, though early on a Sunday is usually a good time to travel anyway. A punk soundtrack and only three hours direct to the multi-storey car park meant that the journey flew by and we’d have plenty of time for a few sherbets. Hotel check-in couldn’t take place before 3pm which meant that’d have to wait until after the game, so straight to Wetherspoons and first pint of the day. The pub proved to be a good choice as it seemed to be a meeting point for stacks of Gooners. Plenty of hugging back slapping and ‘how’s it going?’ followed which launched us into the away trip feel very nicely, thank you. After a couple we moved on for a more traditional taste of Brighton, an Irish pub! 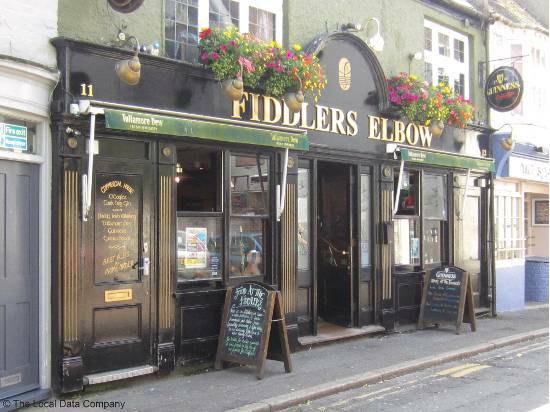 The Fiddler’s Elbow had been recommended and happened to be less than 100 yards away. We just caught them opening at 12, so were their first customers and had a choice of any seat in the house. The next two and a half hours flew by and is now a little like a time lapse video in my memory, twelve o’clock pub empty, half past two rammed to the rafters. Shed loads of Gooners again, chatting to Brighton and Arsenal alike, just as it should be. The first sorties into the packed lunch helped to absorb some of the Guinness. As usual we’d worked out the best way of getting to the ground, the 25 bus from just round the corner in Churchill Square. This was before the main central area where the train station sits, so we had more chance of getting on. 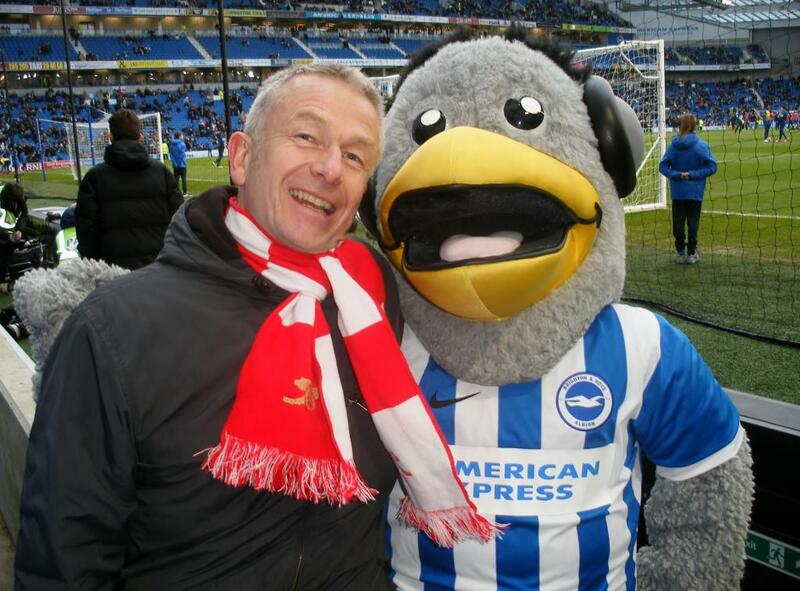 The Amex is several miles outside Brighton and transport is problematic (more of this later). We went past Brighton Pavilion which meant we could get the required amount of sightseeing under our belts. After a couple of stops the bus was full with the driver operating a one off one on policy, so we’d guessed right about where to get on. The 20 minute bus ride took about 45 but after a half dozen beers, proved to be a diverting experience. Arriving at the stadium with a half hour to go to kick off, allowed plenty of time to watch the warm up and for one of the mascots to have his photo taken with a muppet. The game was very enjoyable after Walcott’s early strike settled nerves. Mine and Ant’s eyesight were severely tested with Arsenal’s second as we both thought that Giroud had scored. Big lad in the area scores with his left foot, what were we to assume? Perhaps this was evidence that Mesut has bulked up somewhat while out with injury, or maybe proof that you always see more of the game if you watch on TV (or that we both need new or replacement glasses). Ant had some knobheads to his right who were abusing Szczesny throughout the game in one form or another. Even after the fans sang ‘ He smokes when he wants’, they seemed to fail to grasp the fact that it was intended to support a player in an Arsenal shirt. The second half was a little more scary after Brighton’s early reply but Tommy’s crisp volley proved decisive in the end. Sanchez coming on as sub provoked numerous renditions of his (fairly) new song, ‘Alexis Sanchez, baby, Alexis Sanchez, wohhhoooh’ to the tune of ‘Don’t You Want me Baby’. Not sure about that one but it seems popular. 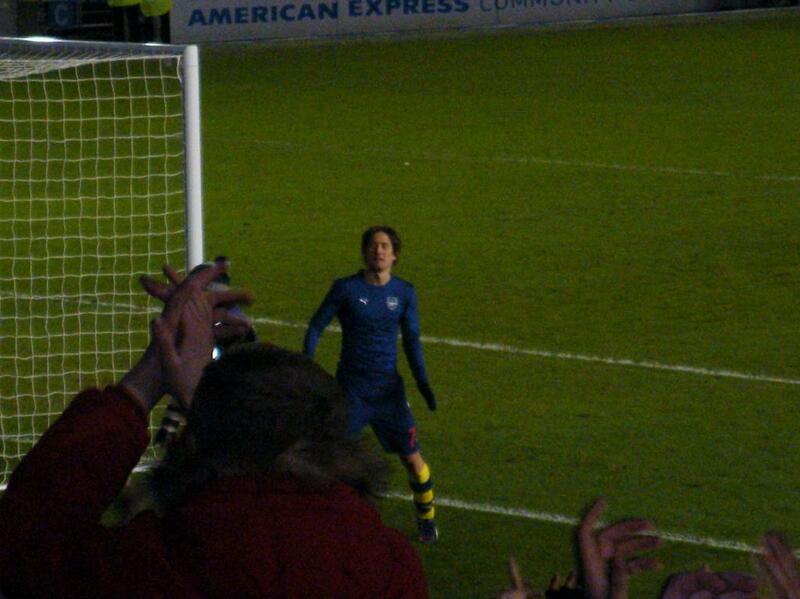 Cue celebrations at the final whistle and Little Mozart throwing his shirt into the Arsenal section. My previous attempts at coronation chicken have always involved Sunday’s leftovers, so I’m back on familiar ground with Hugh Fearnley-Whittingstall’s recipe for cold cooked chicken. The dressing is simplicity itself: 2 tbsp “good spicy fruit chutney” (I use mango, in keeping with the Anglo-Indian theme), mixed with 1 tbsp “good Madras curry powder” and equal parts Greek yoghurt and mayonnaise and tossed through the meat, which is then left to marinate for a couple of hours and finally garnished with toasted almonds and chopped coriander. The sandy colour looks the part to our modern eyes, and the assertively fruity, spicy flavour wins fans too – everyone loves it, although my mum points out quite rightly that the raw curry powder adds a harsh note to the dressing. The yoghurt stops the mayonnaise from taking over the dish, without imparting the slightly buttery flavour of creme fraiche. A solid, crowd-pleasing recipe for anyone in a hurry – and I love the crunch of the nuts. 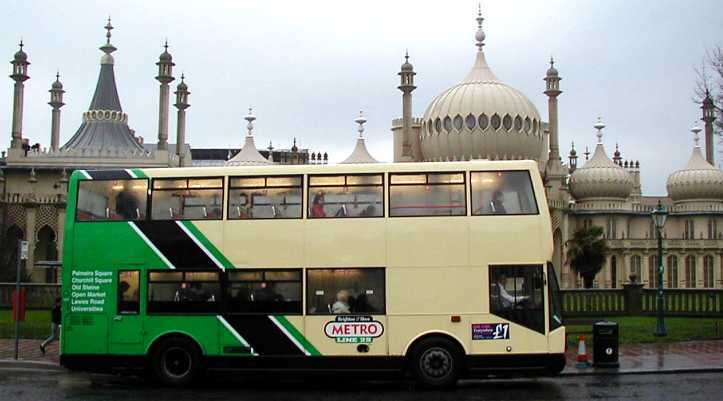 Getting away from the ground was tricky to say the least with the majority of Brighton’s record attendance heading back towards the town centre. There were a few incidents where frustrated supporters from both teams became a little fractious both with the transport arrangements and with each other. We stayed in the ground for a pint after the game but still had to queue for a fair time to get a train back to the city centre. 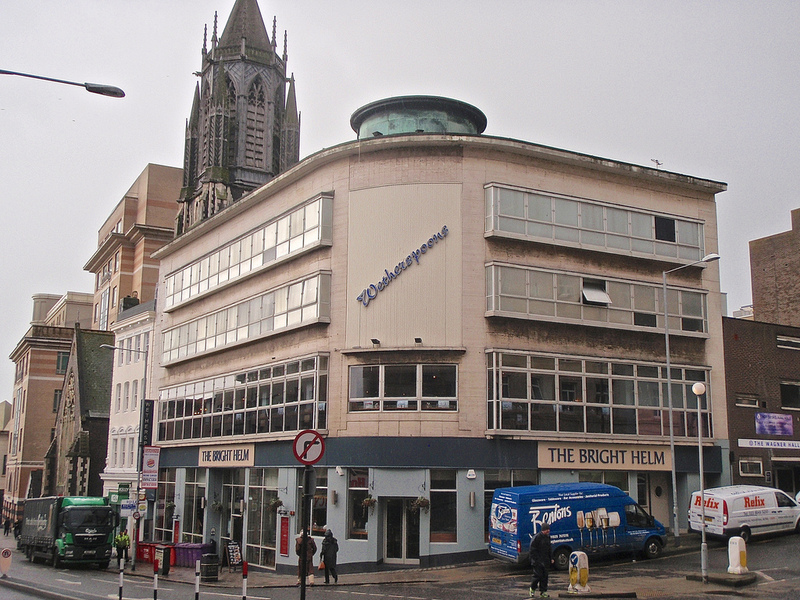 Having finally arrived back in Brighton, we checked into our salubrious accommodation at the Travelodge on Brighton Seafront and set off back to the ‘Spoons for a cheap meal and a couple more celebratory beers. Then, back to the room for 10.30 to see MOTD2 and hear some dubious words of wisdom from Phil Snivel. Firstly, the result. A 3-2 winning scoreline can only be bettered by a 4-3, a 5-4, and so on. Seven changes from a side that went away to beat the current League Champions, and with that, the current Cup Holders marched on into today’s draw. When so many changes are made, we’re looking at squad depth, and players returning from injuries. Recently, Mozart and Santi have been the heartbeat of the side, and yesterday Thomas continued his incredible run of form, coming out by some distance as Man of the Match. Mixing up centre back pairings is always an excellent idea if you want a little excitement when taking on some lower league minnows, and yesterday the plan worked to perfection. 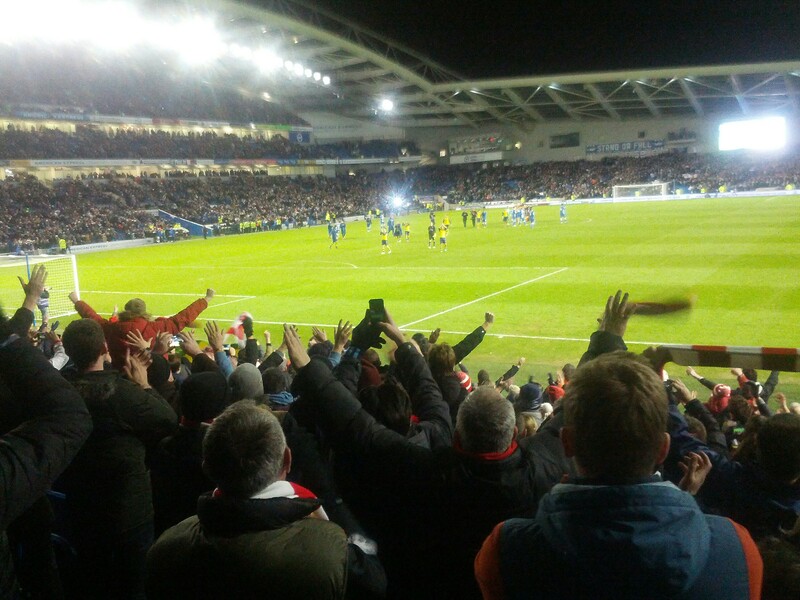 From 2-0 up, the changes had the desired effect with Brighton twice scrambling back into the game to give us the exciting climax we all enjoyed so much. Most Arsenal eyes will have been on the returning Mesut and Theo, and mine were no exception. Really, there were no great surprises. Theo continued to blow away a few cobwebs, and began with a typically clinical finish. As far as I’m concerned, the thought of Alexis suffering a long termer without the goals of Theo is terrifying, so great to see Theo back on the score sheet. Mesut: looks stronger for sure, but as with last season, I don’t believe we will ever see the best of him without a fast striker through the middle. 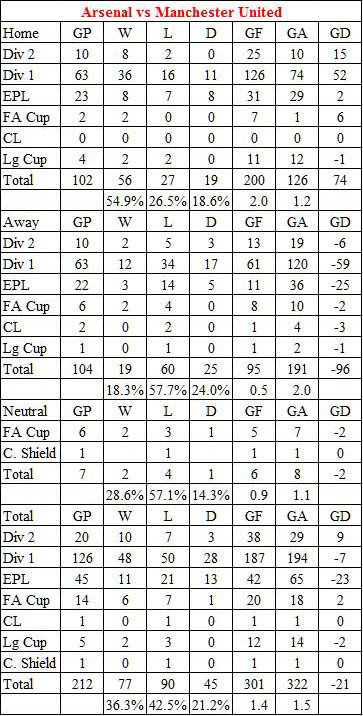 As for the rest of the side, well, ok performances, nothing outstanding but enough to provide an enthralling encounter. RC78 said more or less the same thing in his player ratings, but the most accurate for me was on Ollie: industrious but not dangerous. We played some wonderful moves during the ninety yesterday, and if I was going to be critical it would be the finishing. This should have been a less exciting 5-2. 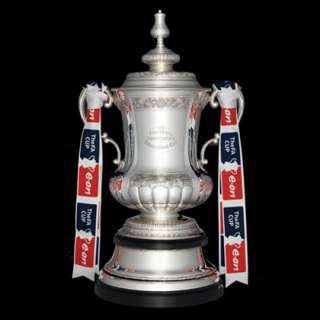 Tomorrow Arsenal plays Hull City in their record eighteenth FA Cup Final appearance; they are tied with Manchester United. Hull City will be making their first appearance. Here is a brief accounting of our Cup Final appearances. Arsenal’s first final, but sadly we lost 0-1 and it’s the only time the FA Cup left England. This was also the first time that there was community signing at a FA Cup Final. The tradition of signing “Abide with Me” which was written in 1847 by a vicar from Devon also had its debut performance. Our first FA Cup victory, and first ever trophy, we won 2-0 on goals by Alex James and Jack Lambert. This was the start of one on our most successful decades, we were led by Herbert Chapman undoubtedly the greatest Manger of his time and arguably Arsenal’s best ever Manager. The Final was interrupted by a fly over of the German airship Graf Zeppelin. Our second loss we were beaten 1-2 with Bob John scoring our only goal. In the thirty eighth minute with Arsenal winning 1-0 Newcastle attacked down the right wing, a long pass appeared to go over the line but it was hooked into the middle and they scored an easy equaliser. The linesman was ninety feet away and the referee sixty feet but the referee still gave Newcastle the goal. Newsreel confirmed that the ball had crossed the line. Our second victory we won 1-0 with Ted Drake scoring our goal. Having won the League Championship three seasons in a row we now added our second FA Cup to our trophy collection. Herbert Chapman had died suddenly two years earlier and George Allison was now our manager. It was our sixth success in League and Cup in seven seasons. Our third victory we won 2-0 with Reg Lewis scoring both goals. 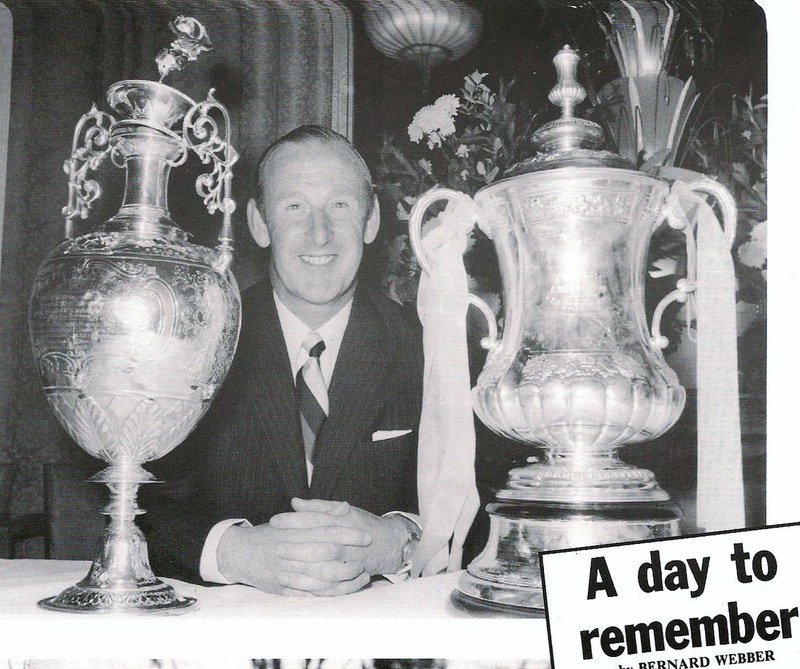 This was the era of the Compton brothers, Denis and Leslie, both were famous footballers and cricketers. They played in both sports for England with Leslie not making his football debut for England until he was thirty eight years old. Our third loss we were beaten 0-1. 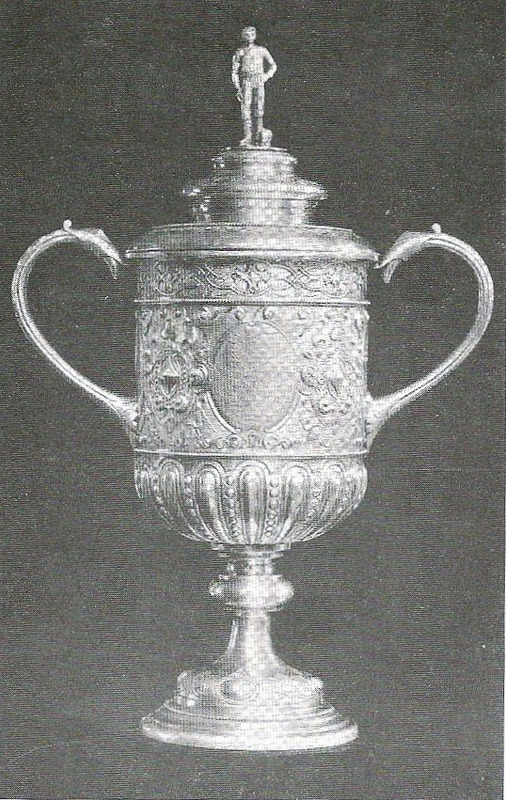 Newcastle became the second club to win the Cup in successive years after Blackburn Rovers in 1890 and 1891. Arsenal was down to ten men in the thirty fifth minute after Wally Barnes was injured, Newcastle scored the only goal of the game six minutes from time. Winston Churchill made the Cup presentation to Newcastle; he is the only Prime Minster to have made the presentation at Wembley. Our fourth victory we won 2-0 with goals by Eddie Kelly and Charlie George. This was indeed Red Letter day for Arsenal, having won the League Championship at White Hart Lane the victory secured our first League and Cup double. We were drawn away in every round of the competition and needed a replay to beat Leeds United in the semi-final. Charlie George scored his unforgettable winning goal from twenty five yards out in the twenty first minute of extra time. Our fourth loss we were beaten 0-1. This was a disappointing day for Arsenal but it set up the first stage of the “Double” for Leeds. They went to Wolverhampton just forty eight hours later needing only a draw to clinch the League Championship but to their disappointment they lost 2-1. Our fifth loss we were beaten 0-1. This was the fiftieth Cup Final and Arsenal was the odds on favourites to win their fifth FA Cup but Ipswich, managed by Bobby Robson, had other thoughts. They reduced Arsenal to nothing more than a supporting role and won the game with a goal in the seventy sixth minute but they also hit the post or bar on three other occasions. Our fifth victory we won 3-2 with goals by Brian Talbot, Frank Stapleton and Alan Sunderland. The game was described as the “Five Minute Final” a routine heavy weight bout with a finish that matched the “Matthews Final” in raw excitement. Arsenal led 2-0 with less than five minutes remaining when Manchester United scored two goals in 115 seconds. Extra-time appeared inevitable until Liam Brady, who was the architect of Arsenal’s first two goals picked up the ball straight from the re-start. He passed to Graham Rix, on the left, who centered to Alan Sunderland and he slid the ball into the net for the winning goal. Our sixth loss we were beaten 0-1. One of the most disappointed Arsenal fans on this day was GunnerN5 – I drove, on my own, four hundred miles through the mountains from Coeur D’Alene, Idaho to Cranbook, British Columbia. I had booked a hotel room in Cranbrook as the game was not being shown in the USA. Even a bottle of Macallan could not mask my disappointment and the return journey, the next day, was one of the longest and loneliest drives of my life. Our sixth victory we won 2-1 with goals by Ian Wright, Wright, Wright and Andy Linighan. Our seventh victory we won 2-0 with goals by Marc Overmars and Nicolas Anelka. 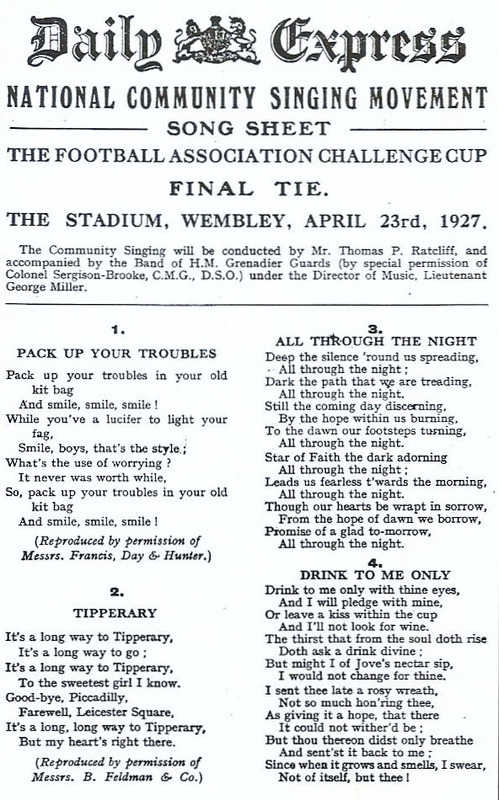 Arsenal finally beat Newcastle in a FA Cup Final having lost to them in both 1932 and 1952. This was Arsene Wengers first full season as Arsenal manager and he ended the season with a fist full of silver after winning both the FA Cup and The League Championship to secure Arsenals second “Double” season. Our seventh loss we were beaten 1-2 with Freddie Ljungberg scoring our only goal. Arsenal dominated the game but Liverpool came from behind to win 2-1, thus winning the FA Cup for the sixth time. It was the second trophy of their treble-winning season of 2000–01: they had won the Football League Cup in late February and would win the UEFA Cup four days later. As well as being the first FA Cup Final to be staged outside of England, it was also the first in which the managers of both teams were from outside the British Isles – Liverpool’s Gérard Houllier and Arsenal’s Arsène Wenger both coming from France. Our eighth victory we won 2-0 with goals by Ray Parlour and Freddie Ljungberg. Ljungberg, having also scored in the 2001 final, became the first man to score goals in successive FA Cup Finals since Tottenham Hotspur’s Bobby Smith, who scored in 1961 and 1962. The match took place with one week remaining in the Premier League calendar for the 2001–02 season. Arsenal were in first position, but still needed a point from their final two games to secure the championship, which they achieved in their next match with victory over second-placed Manchester United. 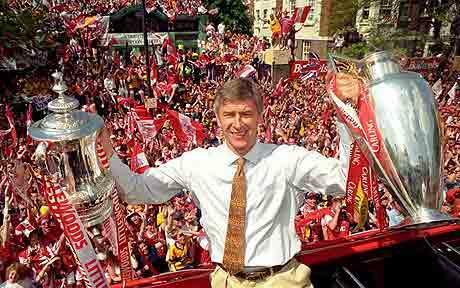 It was Arsene Wengers second and Arsenals third League and Cup double. Our ninth victory we won 1-0 with Robert Pires scoring the only goal. The Gunners won their second Cup in 2 years with a dominant performance over Southampton. The gulf in class between the 2 teams was not evident in the score line as Arsenal won by the single goal, a scrambled shot by Robert Pires. The last 7 minutes of the game saw Arsenal retain almost constant possession accompanied by a string of cheers from their supporters. Southampton had a mere 2 chances to score. the last of which came in the dying seconds as Ashley Cole saved the day with a goal line clearance. Our tenth victory we won a penalty shootout 5-4 with Patrick Vieira scoring the decisive penalty. The game was dominated by Manchester United who did everything but score a goal, Arsenals defence was stubborn to the end and forced the game into a penalty shootout. Van Nistelrooy took the first penalty for Manchester United, in front of the United fans, and sent Lehmann the wrong way to give United the early advantage. Lauren then converted the next penalty for Arsenal, before Scholes stepped up to take United’s second, only to see it saved by Lehmann, diving low to his right. The next six penalties were all scored – Ljungberg, Van Persie and Cole for Arsenal, Ronaldo, Rooney and Keane for Manchester United – leaving Vieira with the opportunity to win the FA Cup for Arsenal in his last match for the club before moving to Juventus. Although Carroll guessed the correct way to dive, Vieira’s kick was just out of his reach, giving Arsenal their 10th FA Cup. Manchester felt aggrieved to have lost a game where they outplayed Arsenal – but frankly who gives a damn? The game is still to be played. The Cup is still to be raised. The story is still to be written.